As a website that concentrates on manipulating LEGO minifigures to create animations, we are often looking for new minifigures to be the actors in our films. The LEGO Collectible Minifigure Series are often easy to get hold of at a decent price, but if you want a minifigure from a specific set, but don’t want to spend the money on buying the whole set, then that minifigure can often be harder to get your hands on and a lot more expensive. The original LEGO version of Rex is up to the usual high standards that they produce. With well detailed, sharp pad printing on the front/back of the torso and legs, the colours are strong and bold with a high level of accuracy to the character from the Star Wars films and animated series The Clone Wars. 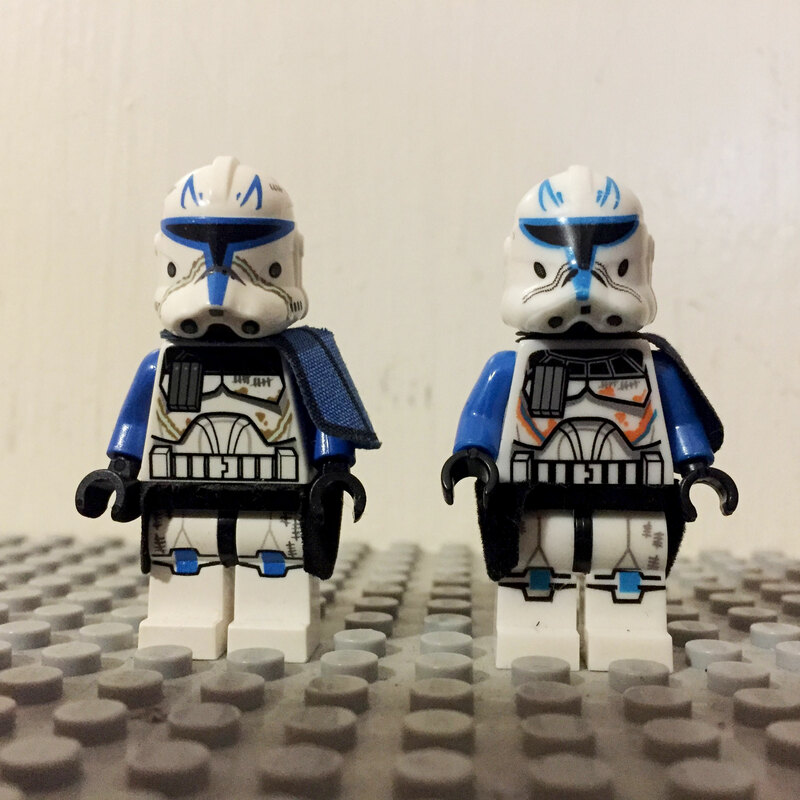 The phase II clone helmet looks great, with fantastic moulding and fine detailed printing with accurate representations of Rex’s signature Jaig Eye markings and tally marks that he is so well known for. The head underneath is similar to the original LEGO Star Wars minifigure clone heads, but with added ‘midnight shadow’ stubble to give Rex a bit more individuality. To finish the character off nicely he also includes a blue and black shoulder Pauldron and a black Kama belt cape. All of the pieces fit snuggly together, with enough friction to hold the arms and legs firm but moveable at the same time, and the helmet fits the head perfectly. In stark contrast to the official LEGO Rex, the copy, despite looking pretty good on first glance, had obvious problems from the moment I opened the package. Firstly, the legs would not connect to the body properly, with hardly any friction between the parts to keep them together, and the legs regularly separating from the torso without any effort. The arms were similar, lacking in any kind of interference, so the arms spun freely within the joint of the body, making it practically impossible to put the arms in any other pose than down by his sides. Similarly, the phase II clone helmet, which is slightly shorter and squatter than the original, doesn’t quite fit on to the stud of the head, making it move around lots and not stay in one place. Print wise, the lines are soft and not as fine, with the colours being weaker, paler versions than that of the original LEGO counterpart and the design having been more or less copied exactly from the original. The figures face is a poor representation of the original, and across all of the elements the moulding and plastic quality of the product doesn’t feel as well made. The shoulder Pauldron is just black, as is the Kama belt-cape. 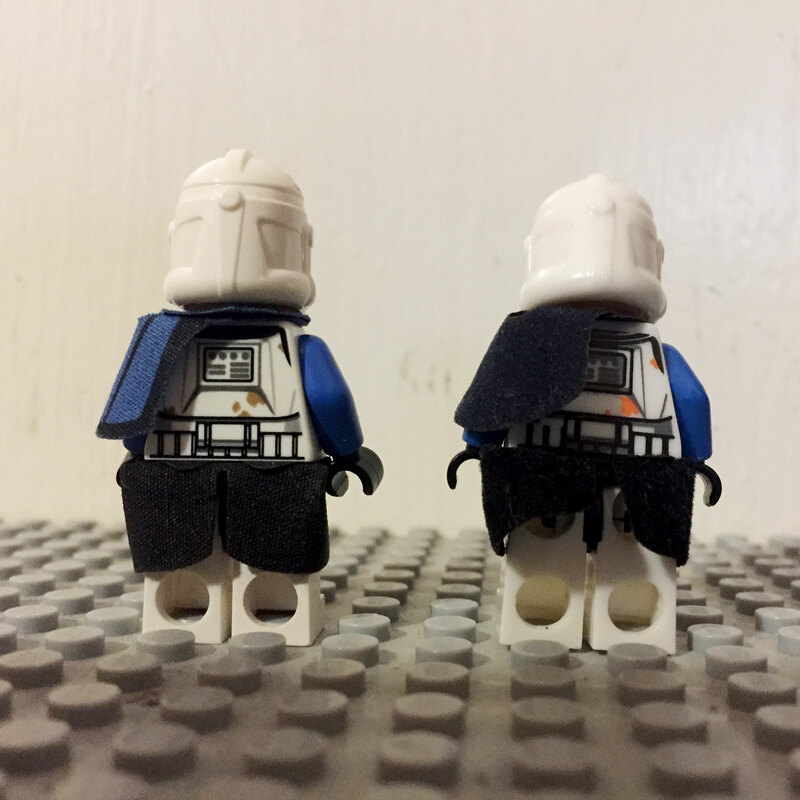 Overall, the Rex copy minifigure, despite being a much cheaper purchase, is vastly inferior to LEGO‘s original in almost every way, from print, through to build quality. As an animator, good quality printing looks better ‘on film’ and the lack of friction on the arms and legs makes it very hard to pose the figure effectively for animation movements. This, to us, really proves the old adage of “you get what you pay for” and although money is sometimes a deciding factor in what and how we do things in life, sometimes it is better to wait until you can pay for the slightly superior product. 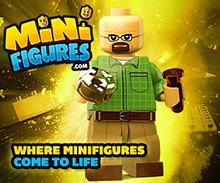 So next time you need a specific minifigure for your animations, we’d recommend you stick with the official LEGO product or go to a company like Minifigures.com or Firestartoys.com who you can trust to sell you quality product. Thanks for reading and check back soon! Until then, keep animating! So firstly let me apologise for our absence the past few months. Real life really took hold as we fought injuries, illness, increased work loads and other problems. All the while I was getting itchy to create, but for the past few months I have had to give over my energy to all those other things, so it was great this long weekend to be able to sit down with some spare time and finish up a few projects that needed some love and attention! As ever, thanks to the guys over at Firestar Toys, www.firestartoys.com who constantly offer their support and products in helping us create our films! 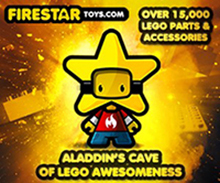 Go check them out for all your minifigure parts needs! So, follow the white rabbit and enter The Playtrix, and we hope you enjoy our new animation! 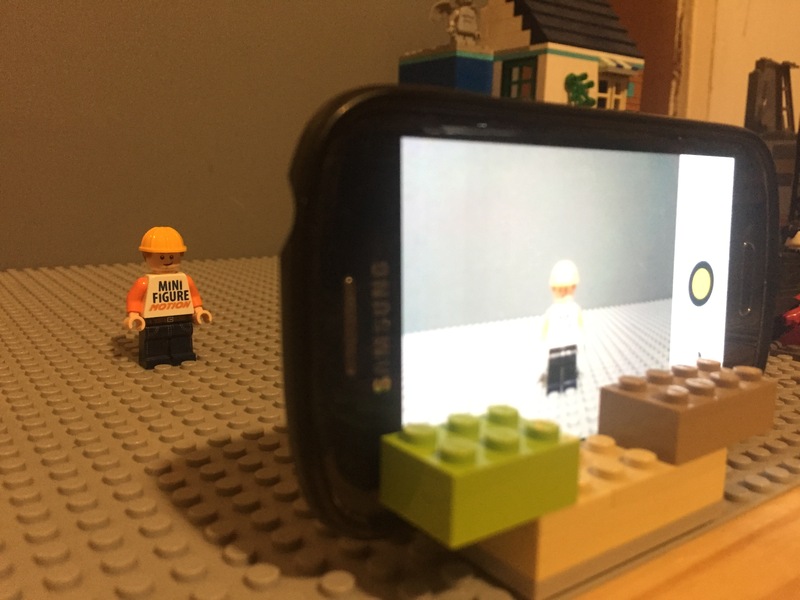 As we continue to look at Stop Motion Animation apps for smartphones and tablets, our next stop is the iMotion App from Fingerlabs and this time we test it on a 5th Gen iPod Touch, with a 5mp iSight Camera. iMotion is available across the iPhone, iPad and iPod range from the iTunes store and can be downloaded for FREE for the basic version. To get the added extras like Manual Focus, Exposure, Onion Skinning and White Balance control is going to cost you £2.99, but at that price, it really is worth it. With heaps of features, iMotion is definitely one of the better apps out there for animating on a smart device. 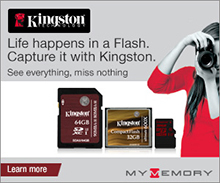 It can shoot video in 720p HD or 1080p HD as either time-lapse photography or as stop motion animation, with 3 triggers for capturing the photos, those being manually, by clicking the onscreen capture button, remotely by connecting another iDevice with the iMotion Remote App running or via microphone. The videos can be made in either portrait or landscape mode, autosave as you go and can be set to variable frame rates to suit your animation techniques. In the full paid version, once your animation is done, a few extra tools allow you to add other photos from your camera roll or music from your Music library, or, if you are feeling creative, you can record your own sounds with the built in mic. Once you are happy with all of that you can export your finished animation out to your camera roll, or to the iTunes share, Facebook, Youtube or email. 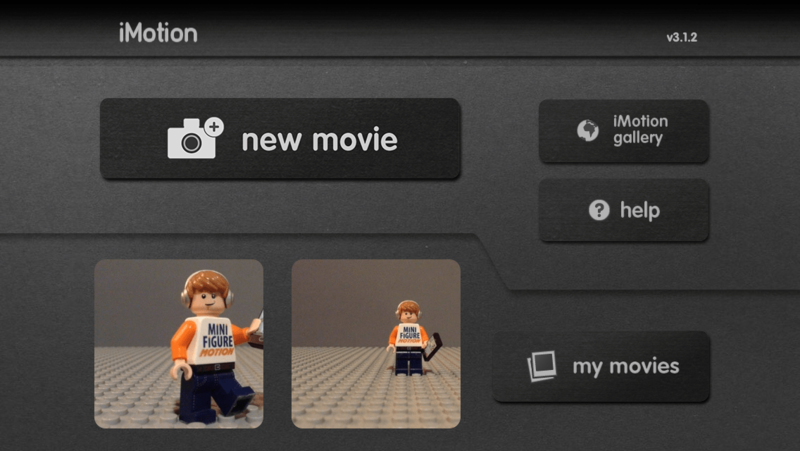 Despite being a powerful little App for Stop Motion, I did find that iMotion lacked a few things that other apps have. Firstly was the editing capability. It seems that frames can only be deleted after the image capture process has taken place, and you can’t see the actual timeline of photos as you take them. That means if you make a mistake, or the camera focuses wrongly (like it can do with autofocus on) you have to wait until you have finished your animation to edit it out. Once you have finished an animation, you can go back and delete or add frames, but if you have moved the camera, this can get quite frustrating. There are no preset titles or theme music that are built into the App, although with the ability to import music and pics from the iPod itself, you could always create your own titles and songs in other apps and import them in to add that finished look to your animation. The manual capture on the iPod worked well, but you got the obvious camera wobble and I found the capture button to be in a rather inconvenient place, the middle bottom of the screen, which my camera rig got in the way of,making it difficult to snap those shots… So I tried the microphone trigger and struggled to get that working at all, so finally I looked at the remote control trigger via my iPhone running the iMotion Remote app… This worked really well, except there was no sound alerting me that the shot had been taken, which honestly did confuse me a few times, meaning I took the same shot 2 or 3 times before realising it had already been taken… In the videos below you can see both the manual capture and remote trigger being used for image capture. All in all, iMotion is a pretty solid little app, that at only £2.99 for the full package you can’t really complain about. It is full of great features and regular use would help iron out some of the down sides as you got more and more used to working with it. I will definitely be keeping this on my iPod, just in case I am out and about and feel the need to animate! Recently, I wanted an app for my Windows Nokia Lumia 635 Phone, for when I’m out of the house, and needed to make some stop motion videos. 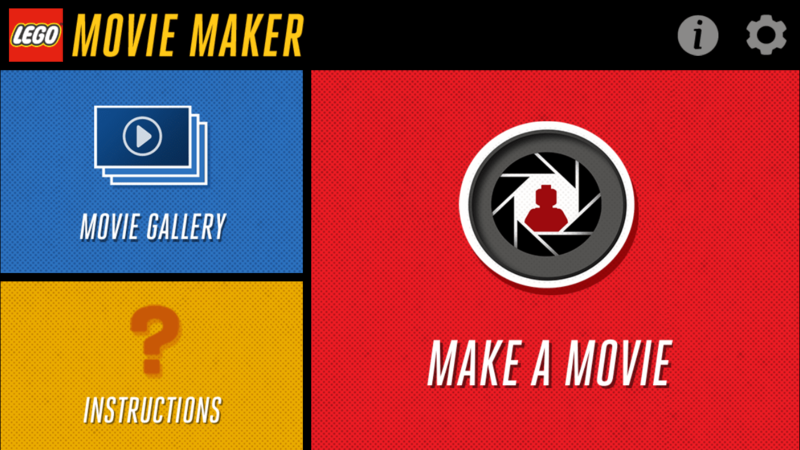 I came across an app called Stop Motion Studio, from Cateater LLC. 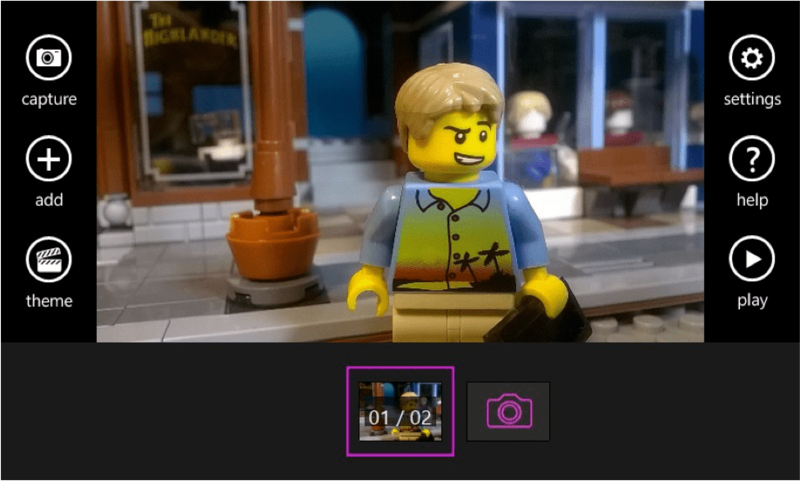 Before I get into the app, I would like to mention the range of stop motion apps on the Windows store. I searched the Windows App Store for a while, and unfortunately, only came across one app. As the Windows phone isn’t that popular, I assume this is the reason why that there are not many stop motion programs, which means you are restricted to the one app – Stop Motion Studio. But does it suit your brickfilming needs? Barely. I can’t say I’m happy. While this app does have its pros – such as its basic layout, and a free download, the cons make the app very frustrating to use. This is great, which makes it very accessible to people who may not want to spend money on stop motion just yet, or people who want to try out stop-motion for the first time. When using the app, I found it quite easy to get to certain tools. Tools are labeled, or had a practical symbol to represent it. An example is the capture tool, a simple symbol of a camera and below, clearly labeled “capture” which tells me that this where you tap to take photos. The frame rate of your animation can be controlled from 1 FPS – 30 FPS which is great, compared to the other apps I have seen where the FPS doesn’t go past 10. Very frustrating to export animations. When I was done finishing a little short animation which I was happy with, I was hoping to share it to a couple of mates. When I tapped on the option to save, chose the quality and chose the folder I wanted to store my animation in, right after – the app crashed! After trying multiple times, using the same process – no matter what I do, it still crashed! This is very frustrating to those who want to save it to your album, or share with friends or YouTube. I am hoping they will fix it in a future update. I did, however, find an option to email it to myself, which I can then send it to a computer or another device. That however, comes at the price of image quality as there is no option to choose what quality to send in, which in the end, was not worth it. While the app is free to use, most features of the app, are locked, and are unlocked by purchasing an add on pack. For features as small as adding title cards and adding in your own voice? They should have been included without buying it! I could understand locking features such as green screening or a draw tool, but for titles cards and adding audio, is just ridiculous. Especially when the iPhone version has way more features than this and most of it is free! 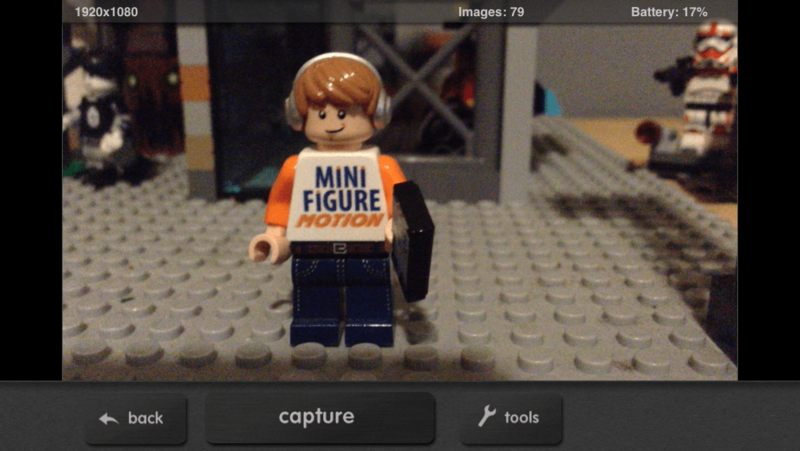 The app has potential to be a great tool for stop motion. But due to its locked features and a lot of glitches, I do not think I will be using the app, in the near future. Very disappointed. 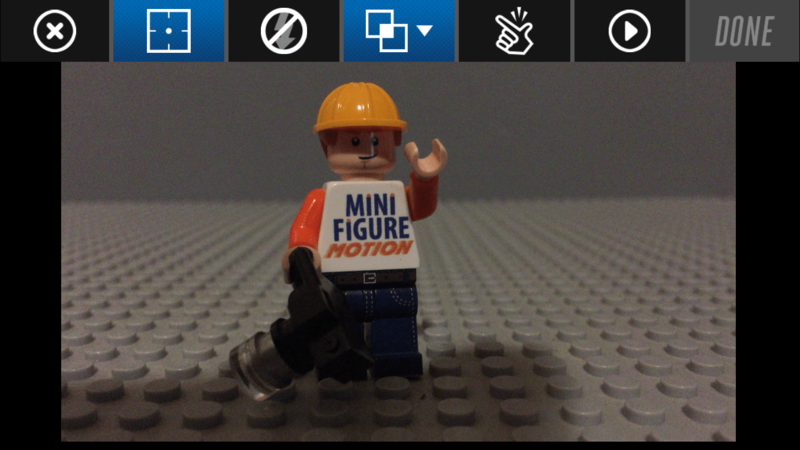 I will continue to search for stop motion apps that works for windows phones and hopefully, one day, I will find an app that will be suit my brickfilming needs, and hopefully yours too. So, in keeping with our series of Stop Motion apps on Smart Phones and Tablets, today we look at an App called Motion on a Samsung Galaxy GT18200N from 2014 running Android 4.2.2 with a 5mp camera. But I wasn’t happy with the results, and was certain that there must be something descent out there for Android users to use… So, back to the Play Store and there I found my go to animation app, the FREE version of Stop Motion Studio from Cateater LLC. I have been using this on the iPad for a couple of years now and pretty much know the software inside out, so I wondered how it would behave on the Android and if it would solve the focus problems I had had with several of the apps I had been looking at. I am not going to do a review of Stop Motion Studio now, but needless to say I would always recommend it, it is solid, has some great features and seems to be available on most smartphone and tablet operating systems. Sorry for such a long blog, but this is the result of 3 hours of animation issues! Continuing with our Smart Phone Stop Motion series, today we look at Stop Motion Café on the iPhone 6, which is available for FREE from the App store, and works on iPhone and iPad. Getting straight into it, this is a relatively simple app that lacks a lot of the bells and whistles of some of the other apps we have been looking at for this series… That doesn’t mean it isn’t worth a look though. There are no themed titles, no libraries of music to add, no sound fx and no frame-by-frame editing to add drawing, or change the colours, contrast etc and lastly there are no filters to add to your final video. It also lacks a focus and exposure lock, which would be very handy. Using this on an iPhone 6 seems to be a little problematic, as it doesn’t seem to be optimised to work on the slightly larger iPhone 6 screen and seems it would be more suited on an iPhone 4 or 5. This only really causes a problem in the image capture section, where it cuts the bottom menu in half, but seeing as the controls in that menu aren’t that important it doesn’t make a huge difference. The animation features of the app are pretty good, including access to the flash, onion skinning (or ghosting as they seem to refer to it) as well as a frame counter, HD on/off and the ability to switch between iPhone cameras, allowing you to use the front or back camera as you need. It supports and can save multiple projects, which you can go back and do some basic editing on after you have finished shooting. The editing, as I said, is simple… You have the ability to save out separate frames to the camera roll, as well as duplicate frames or delete them to get rid of any nasty mistakes you may have made. The video can be set at speed of between 1fps – 30fps, and once you are finished you can “Elaborate” your movie, which renders the animation and saves it to your camera roll in 720p HD. Despite its lack of features, and the slightly childish look to the app, the image quality is better than some of the apps we have been testing and it is very simple to use, making it great for people who are just starting out in Stop Motion. There are better apps out there for the iPhone and iPad, but if you are looking for a quick, easy and simple Stop Motion app, then Stop Motion Café might just be for you. Check out the test video below to see what we did with Stop Motion Café! 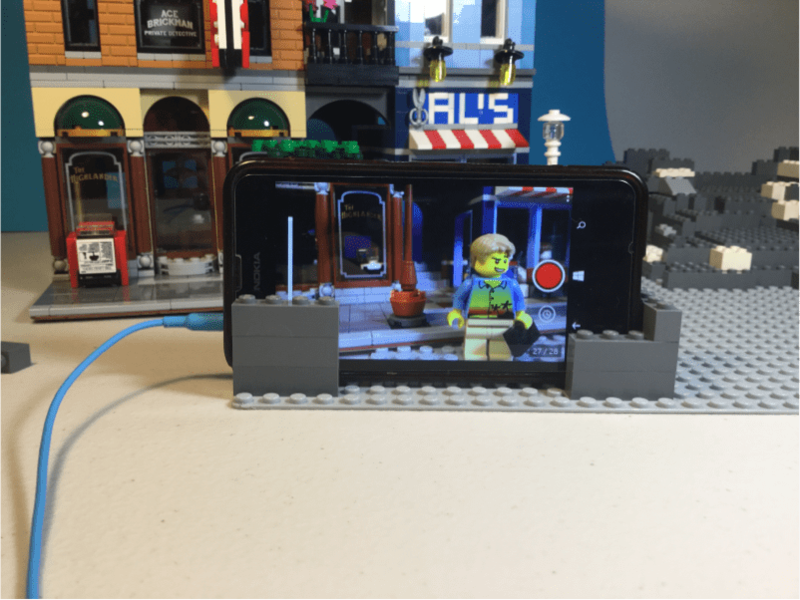 Today we continue to look at Stop Motion Apps for smart phones and tablets, with this blog concentrating on the Lego Movie Stop Motion App being used on an iPhone 6. The animation features of the app are pretty good for a smartphone, with a the ability to be able to adjust the focus, activate the flash, overlay grids or onion skinning as well as a very neat little feature that allows you to snap your fingers to take the photos. This saves you having to touch the iPhone whilst animating, thus eliminating any camera wobble or movement. Once you have shot your Brick Film, you can then use the editing facilities to delete or add frames, change the duration of individual frames, apply various filters like Black & White, Contrast or Vignette to the whole movie and even add graphic style “stickers” to separate frames. There are also a whole host of pre-loaded sound effects you can add to frames, with car sounds, birds, comedic boings and many more in the library. If you are feeling adventurous, you can also record your own sounds and use them time and time again. To complete your movie, you can pick one of the 12 pre-loaded “Lego Movie” themed songs to play under your movie, all of which sound great and add some flavour to your film. 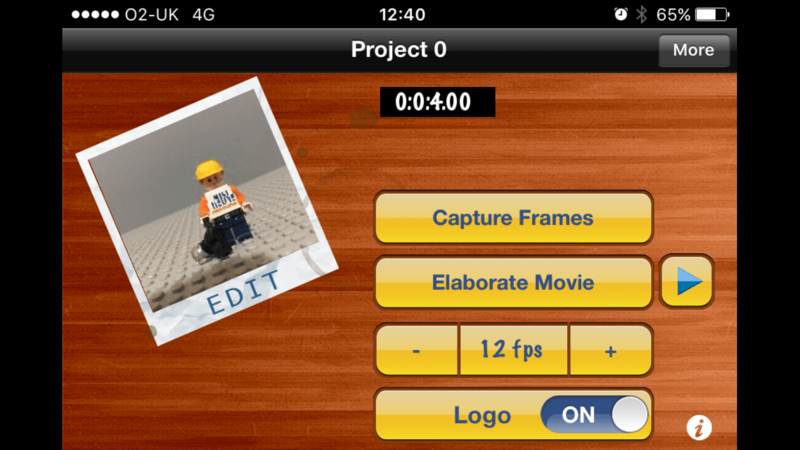 The biggest let down of this app for me was the available frame rates… We have been looking at a lot of Stop Motion Apps recently and most have a range of 1fps to 30fps… Most Brickfilmers will use a frame rate of anywhere between 12 to 24fps, but the Lego Movie app has a maximum frame of only 10fps, giving your final movie a slightly stuttery feel. Overall, the picture quality is good with the iPhone 6 camera shooting at 8MP and the app exporting videos out at 1080p HD. You can save your movies into the Movie Gallery and then export them out into your Camera Roll on to your phone or tablet, where you can upload to YouTube from there. 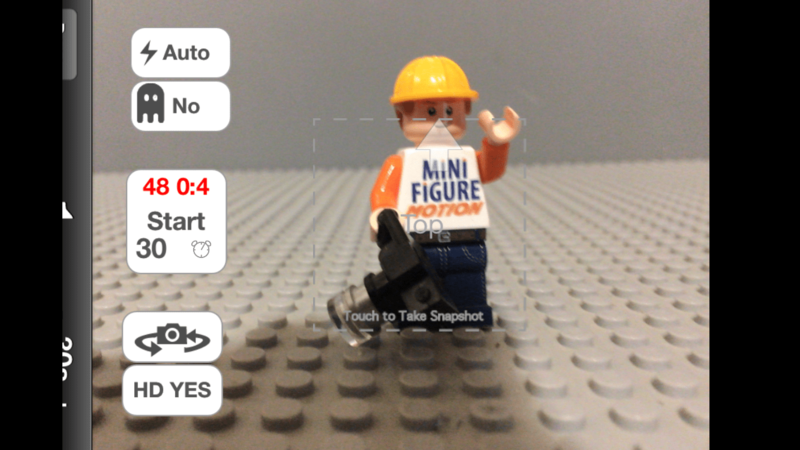 If this app had a better frame rate, I might actually use it myself, but again, this is a great entry level app that will be great for giving kids a start in animating Brick Films. Check out the test video below to see what we did with it! He sat for a good couple of hours making various test animations and working out the best way to use the software, move the minifigures around and add the music and titles to his films. 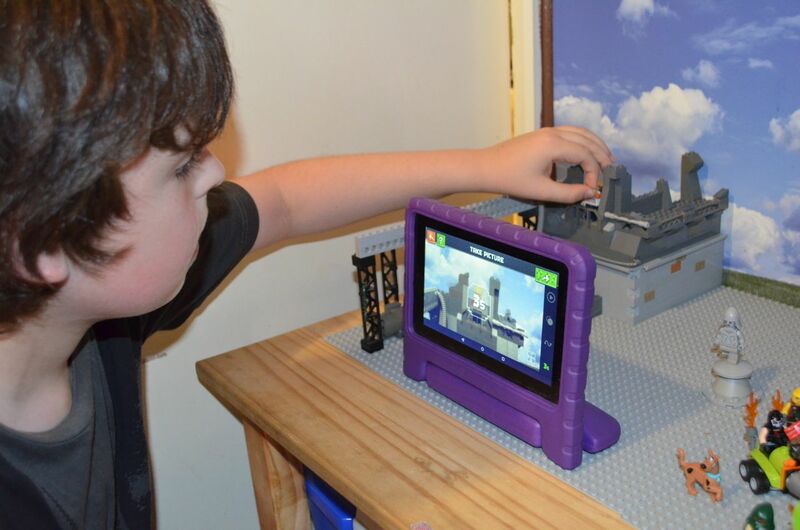 The software seemed quite intuitive to him, and the tutorial slideshow that was part of the App was easy for him to understand and gave him a good beginners insight into the Apps functions as well as the basics of stop motion animation. Like most stop motion software, you can take pictures from within the app, and it strings them all together on the timeline, allowing you to change the frame rate from 1 to 30fps and has the option to delete frames that are wrong or you want to change. The editing options include basic colour control of the frames (Brightness, Contrast, Hue, Saturation), the option to extend the length of individual frames, a text editor and the ability to add and record sound fx, which for an App that is FREE to download, I didn’t really expect that much. One of Morgan’s biggest problems was camera wobble, as his Kindle is in a case which has a stand on it, but isn’t that stable. Every time he touched the screen the Kindle would move slightly and that camera shake was evident in his animations, so we resolved this by using the Apps handy 3 second timer function which was enough time for the Kindle to settle before the picture was taken. By using this, Morgan saw a great improvement in his final movies. Once you have finished your animations, the Minecraft Stop Motion software has some Minecraft themed title screens, fonts, and colour choices so you can add titles and outro credits to your movie, plus 9 video effects like Pixellated, Vivid and Underwater to change the look and style of your video. Lastly you can choose from one of 11 Minecraft theme pieces of music to play under your movie, which can then be rendered and exported to the in-app Gallery at 720HD. I managed to get the animation off of the Kindle via it’s USB cable and onto my iMac as a .webm file, which I had never heard of before. I managed to convert that in Handbrake to an MP4 which was usable for YouTube. Unfortunately, there were a couple of downsides to animating with the Kindle. Firstly the camera on the Kindle is only 2MP, so image quality isn’t that great and the video ends up slightly pixellated and noisy. Secondly there doesn’t seem to be a way of adjusting the camera focus from within the Minecraft Stop Motion App, meaning that you always have to keep the camera at a set distance. But again, this is a FREE app, aimed at kids on a tablet that costs £50 from Amazon, so I suppose you can’t expect too much! Overall Morgan had a lot of fun using the App and it allowed him to express himself creatively as well as learning to do things for himself. Although being a great starting point for him, he has expressed an interest in trying to find a better Stop Motion app for the Kindle, so we are, of course, going to have a look for that, and probably do another blog once he has had a chance to use it. But, for a simple, fun and creative step into Stop Motion animation, the Minecraft Stop Motion Movie Creator is a good start, but it won’t be long until you find yourself wanting for something a bit better!